Our OPRS main product includes all of the following modules. Registry, Contribution, Gift Certificate, Religious Education, Sacrament Preparation, Sacrament Books, Youth Ministry and Parish School. All modules are connected together and work as one. Registry Records contains all of the registered or potential families & members that you want to keep in touch with. Registry Records feeds all other modules so that everyone can share the same member records. 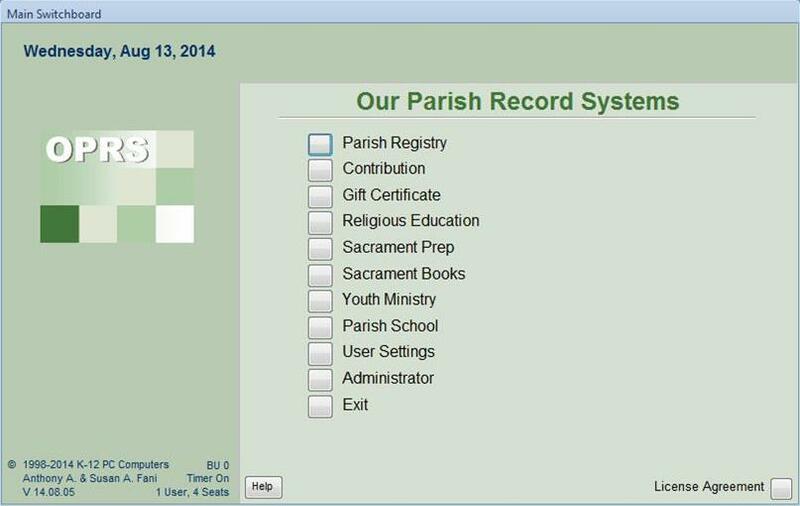 Contribution Records was developed as a very flexible tool that any parish can use to enter donations the way you want and need. You can enter donations with or without envelope numbers. There is no right or wrong in how you chose to do it. We have also developed a way to speed up entries depending on how and when you enter each week’s collections. Our software makes use of memory fields that can greatly speed up the entry process. If you have more than one entry person no problem, two people can enter at the same time. Each person can customize the entry screen to their personal preference. Gift Certificate Records is used by some parishes as a method of fund raising. The screen looks and works just like the Contribution Records above. Religious Education is very important to all parishes. We have included a module for organizing your students and leaders or teachers to help simplify your program. Speaking of programs, we include a Program field that each student can be assigned to in addition to their Class and Grade. This allows very large parishes to organize their students any way they need. One example could be Adult and Child. Another possibility would be to use Colors. You can enter anything you want for Program Titles. Sacrament Preparation includes three separate sub-modules to manage any parishes Sacrament program. Catholic parishes may use two or all three modules to manage the groups preparing for Reconciliation, Communion & Confirmation. All three sub-modules allow for scheduling events such as practices, meetings or retreats. There is also a feature that allows a completed group to be transferred into our included Sacrament Books module with the press of a button. You can also print Certificates, letters and labels as needed. 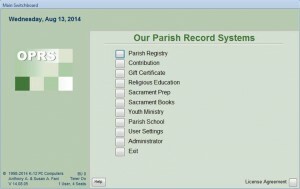 Sacrament Books is for storing records of all sacraments received at your parish. We recommend using it for all new sacrament made moving forward and for archiving prior sacrament records that were recorded in books. You can also print Certificates, letters and labels as needed. Youth Ministry can be used for any size Youth Program to help stay in touch with your leaders and members. We have included many customizable fields and filters so you can create the perfect way to manage your program. Parish School is a simplified module for recording basic information about your students and teachers. You can manage fees, grades, class assignments and more. Please contact us if you have any questions regarding any of our software.